The physiological and pathophysiological regulation of glucagon secretion from pancreatic alpha cells remains a hotly debated topic. The mechanism(s) contributing to the glucose sensitivity of glucagon release and its impaired regulation in diabetes remain unclear. A paper in the current issue of Diabetologia by da Silva Xavier and colleagues (doi: 10.1007/s00125-010-2010-7) provides intriguing new insight into a metabolic sensing pathway mediated by the per-arnt-sim (PAS) domain kinase (PASK) that may contribute to both the paracrine and the intrinsic glucose regulation of alpha cells. Importantly, the authors show that PASK is decreased in islets from patients with type 2 diabetes, providing a potential mechanism for impaired suppression of glucagon by hyperglycaemia in this disease. Much work remains to be done to determine the exact role and mechanism of PASK in alpha and beta cells. Nevertheless, the present work introduces a new player in the metabolic regulation of glucagon secretion. 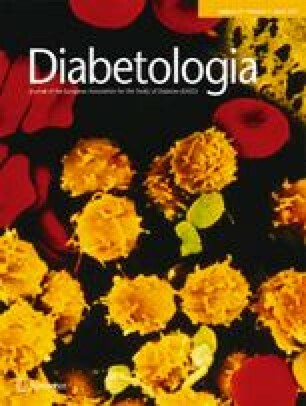 Inappropriately elevated glucagon secretion from pancreatic alpha cells has been recognised as an important contributing factor to hyperglycaemia in diabetes for more than three decades [1, 2, 3]. Although under-studied for some time, both the physiological mechanisms that control glucagon release and the pathophysiology that contributes to altered glucagon regulation in diabetes have seen a resurgence of interest in recent years. The importance of glucagon has recently been underscored by the potential therapeutic value of antiglucagon approaches  and new insights demonstrating the importance of glucagon suppression in the glucose-lowering effects of glucagon-like peptide-1 . Thus, diabetes is once again recognised as a ‘bi-hormonal’ disease where impaired regulation of both insulin and glucagon contributes to elevated blood glucose levels. One of the more intensely debated topics relating to glucagon secretion over the past few years centres on the physiological mechanism(s) regulating glucagon suppression by hyperglycaemia, and there are several schools of thought on this . Glucagon is produced in pancreatic alpha cells and its release requires electrical activity and elevations in intracellular Ca2+ that trigger regulated exocytosis , much like that seen for insulin secretion from beta cells. It is upstream of this process where the picture becomes cloudy. There are clearly important extrinsic paracrine and neuronal inputs that control glucagon release (reviewed by Gromada et al. ). In addition, we have proposed  a direct effect of glucose to inhibit glucagon release, owing at least in part to the unique electrical properties of alpha cells in both rodents and humans [9, 10]. However, reconciling these several views and linking them to the pathophysiology of glucagon release in diabetes, particularly the effects of glucose on glucagon secretion that are direct or those that are mediated indirectly through beta cells, has been problematic. In the present issue of Diabetologia the study by da Silva Xavier et al. provides an intriguing new piece of this puzzle, and suggests a common metabolic sensing pathway may underlie not only the direct and indirect effects of glucose on glucagon, but also the pathophysiology of the alpha cell in diabetes (outlined in Fig. 7 of da Silva Xavier et al.). Much recent work has examined the role of AMP-activated protein kinase (AMPK) in the regulation of insulin secretion [12, 13, 14]. AMPK is a serine/threonine protein kinase that acts as a sensor and regulator of energy balance at both the cellular and whole body level . An increase in intracellular AMP level activates the enzyme. Thus, when cellular energy levels fall, AMPK activity blunts insulin granule recruitment and secretion . Conversely, AMPK activation upon falling cellular energy levels is suggested to augment glucagon secretion . The da Silva Xavier study focuses on the per-arnt-sim (PAS) domain kinase (PASK), another serine/threonine kinase  implicated in the sensing of cellular energy homeostasis, the control of insulin gene expression  and the modulation of insulin gene expression under pathophysiological cell culture conditions . However, while Pask –/– mice displayed reduced plasma insulin responses to glucose they showed normal glucose [21, 22] and insulin  tolerance. da Silva Xavier et al. now examine whether PASK may function as a metabolic sensor in alpha cells. Their data intriguingly suggest an underlying metabolic sensing pathway contributing to both the paracrine and intrinsic regulation of glucagon secretion from alpha cells (da Silva Xavier et al., Fig. 7). Islets from mice lacking Pask1 (Pask1 −/−) were shown to exhibit impaired glucose-dependent suppression of glucagon secretion. Furthermore, small interfering RNA (siRNA)-mediated knockdown of Pask1 in clonal alpha cells recapitulated this effect. This latter finding is consistent with a role for PASK as a metabolic sensor and potential transducer of glucose signals within the alpha cell itself. However, the relative contributions of beta cell PASK and alpha cell PASK in the intact islet remain to be determined. This is particularly important given that the Pask1 −/− islets displayed reduced insulin content, and in the intact islet this may result in a relative loss of paracrine regulation of glucagon by the beta cell. Whether the primary action of PASK on glucagon secretion is mediated through the beta cell, or through the alpha cell itself, could in part be addressed by the selective downregulation of PASK in beta and/or alpha cells. da Silva Xavier et al. show that glucose upregulates PASK production in human islets and, perhaps more intriguingly, that PASK levels are decreased in human type 2 diabetes. The latter is consistent with in vitro work in rodent islets by Fontes et al. showing reduced PASK levels in response to chronic exposure to palmitate. In that study, upregulation of PASK ameliorated the effects of palmitate to reduce insulin gene expression. In the paper by da Silva Xavier , the PASK pathway is suggested as a possible pharmacological target for the treatment of type 2 diabetes. Some credence is lent to this idea by the demonstration that upregulating PASK production by recombinant adenovirus was able to suppress glucagon secretion in clonal alpha cells and human islets. However, it should be noted that the major effect of PASK upregulation was to suppress glucagon secretion at low glucose levels. The clinical utility of this, while promising, is unclear. The true test may be whether normalisation of PASK levels in islets from type 2 diabetic donors restores normal glucose-dependent regulation of glucagon secretion. Finally, the paper by da Silva et al. , in demonstrating a novel pathway regulating glucagon secretion and potentially involved in alpha cell pathophysiology, provides a strong impetus to further understand the upstream and downstream signals regulating PASK and its effects on glucagon secretion. It will be critically important to determine the metabolic signal that is being sensed by PASK, which is yet to be identified. Some insight is, however, gained into the downstream mechanisms responsible for PASK effects on glucagon secretion in the da Silva Xavier study. Notably, the authors demonstrate an upregulation of the AMPK-α2 subunit, which they have recently demonstrated to stimulate glucagon release . Whether this accounts for the failure of glucose to suppress glucagon secretion is also yet to be determined, and in particular the mechanism by which AMPK and PASK interact to modulate glucagon will prove particularly interesting. How does AMPK differentially regulate glucagon secretion from that of insulin, where it exerts a negative regulation of insulin granule recruitment ? We proposed that differences in ion channel expression and action potential generation contribute to the opposing regulation of insulin and glucagon [10, 23]. In this context it is interesting to note that AMPK is suggested to regulate several important ion channels involved in pancreatic hormone release, including voltage-dependent Na+ channels , ATP-dependent K+ channels , KCNQ channels , Kv2.1 channels  and BK channels . It is pertinent that all of these are implicated in the regulation of glucagon secretion [10, 29]. It will be interesting to determine how glucagon secretion is affected by glucose in islets obtained from patients with type 2 diabetes and whether the hypersecretion of glucagon (predicted from in vivo studies ) can be corrected by overproducing PASK. These are challenging experiments but they may lead to pharmacological treatments that specifically target glucagon secretion. Clearly, the study by da Silva et al. provides an exciting new piece of the glucagon puzzle—but it is not getting any easier! Research in the authors’ laboratories is supported by operating grants from the Canadian Institutes of Health Research to P. E. MacDonald and P. Rorsman and from the National Science and Engineering Council of Canada to P. E. MacDonald. P. E. MacDonald holds scholarships from the Canadian Diabetes Association and Alberta Innovates—Health Solutions, and the Canada Research Chair in Islet Biology. P. Rorsman holds the Canada Excellence Research Chair in Diabetes.